Thank you all for the overwhelming echo to my turorial! I'll add some more turoials soon - please contact me if you wish some special topics! A colleague asked for an elegant card for a silver wedding. As I had little time, no, actually I had NO TIME AT ALL, I decided to use a very simple card design and catch the eye with this wonderful stamp by Butterer which symbolizes life-long love in a perfect way, as I think. I stamped it with Versamark onto ivory cardstock, then embossed with silver sparkling embossing powder. I watercolored the image with Twinkling H2Os, Stargazers and PearlEx. As I wanted to give the image a somewhat understated look, I chose very light color hues and blended them all with some silver color to keep in the color palette I chose. 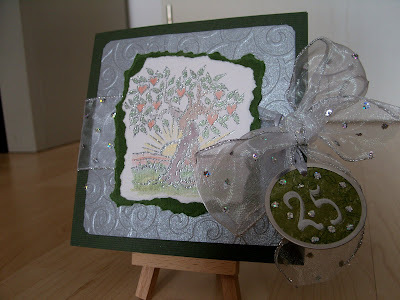 I added some green torn cardstock and a cuttlebugged silver piece of cardstock. 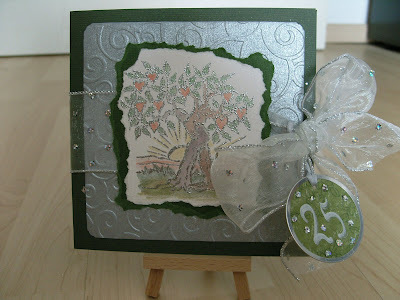 Between these layers I put a sheer silver ribbon with palettes which I used as closure for the card. As there fell down some palettes when I tied the bow, I collected them and used them as embellishments for my round tag (which I made with the Making Memories Tag Maker). The numbers are hand-written.